With winter approaching, some of the most vulnerable in our society — children and young people — could use a little help to stay warm and Steiner Electric, the Salvation Army and the Rockford community once again stepped up to help area children in need. A Koats4Kids hut outside Steiner Electric’s Rockford facility. For the 16th year, Steiner Electric partnered with the Salvation Army for its annual Koats4Kids drive. Steiner is pivotal in collecting and distributing cold-weather clothing to children in Rockford and the surrounding areas who may otherwise go without during the cold winter months. Nagel points to one of Steiner’s employees who rarely takes credit for his efforts, but gives his time, and carpentry expertise, to this cause. Traffic Supervisor Gene Bullock has been supporting the drive for 16 years, primarily through the construction of sturdy, wooden collection huts. Bullock constructs the tall, wooden huts with spring-hinged doors for easy access. They are built directly on a pallet so that a Steiner crew using a pallet jack and company truck can move them where needed. Steiner provides all the transportation for the delivery and collection of the huts and barrels to and from 35 donation sites. Donated items must be in good wearable condition, clean, and not have any holes or stains. Adult sizes are accepted as many kids wear them. Items donated at Steiner’s Will-Call Counters were transferred back to Steiner’s Rockford facility and then transferred en masse to the Salvation Army. If you’d like to contribute, it is not too late to help. 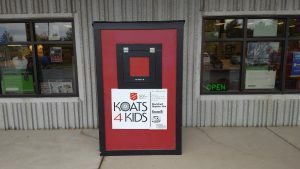 The Koats4Kids Campaign runs through Oct. 21, and you can donate directly to the Salvation Army’s donation page by clicking here. In 2016, Steiner Electric donated the following items to the Koats for Kids clothing drive.